And another Manhattan neighborhood is down with Insomnia. No, not sleeplessness—every New Yorker is afflicted with that (hence the whole coffee-in-the-hand thing). We mean the only place that will deliver freshly baked cookies to your door until 3 a.m. So for those of you insomniacs who don’t live near NYU or any of the other 4 locations, the company has opened up a rather convenient location in midtown, on 53rd street between 3rd and 2nd avenues. The best part is, it doesn’t end at cookies. You can get brownies, ice cream, and of course, some milk to wash down the sweet treats with. And we all know that along with new beginnings comes celebration. 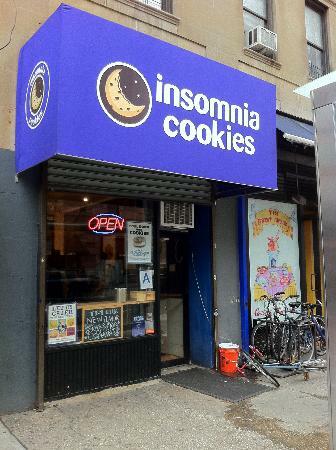 Whether you never tried insomnia or are a chronic insomniac, you can take part by going to their FaceBook fan page and scrolling down to print the free cookie coupon and 3 for $2 deal coupon to use at the new store. Honestly, no other cookie bakery will cut that much slack, so why not use both deals? Separately, of course. For the grand opening of the new location, just “like” their page and follow their website—you’ll find yourself on top of every sweet deal all the while staying up and giving yourself insomnia. Pun totally intended.